Enter course name, code or keywords below. We welcome students from all over the world. We’re home to almost 6,000 international students from over 100 countries. We offer scholarships for all kinds of study and to all kinds of eligible applicants. Check it out. Course chosen – tick. Entry requirements met – tick. Closing date checked – tick. It's time to apply. Got an offer from ECU? Step through our Virtual Information Pack to respond to your offer. Enrolment sorted! We might be the youngest of the universities in Perth, but we're Australian leaders in teaching quality and overall student experience. For the twelfth year in a row, ECU achieved a 5-star rating for Teaching Quality in the Good Universities Guide. ECU domestic graduates gave a 5-star rating for median salary, based on the starting salary in their first full-time job. 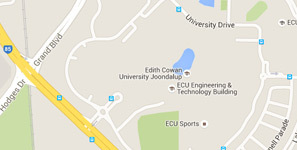 ECU respects the Nyoongar people, the traditional custodians of the land on which our campuses are built. We're also committed to developing our Aboriginal and Torres Strait Islander students and staff. If you're interested in studying here, visit our web page to see introductory courses, financial support and more. If you're thinking about becoming a student, or you're already here, there are many ways to get in touch or to find your way around.